Jenson Button feels winning the Super GT title in his debut season is “just as big” an achievement as his Formula 1 championship success in 2009. Button and Kunimitsu Honda team-mate Naoki Yamamoto clinched the 2018 GT500 title by finishing third in the Motegi finale, beating TOM’S Lexus drivers Nick Cassidy and Ryo Hirakawa by just three points. 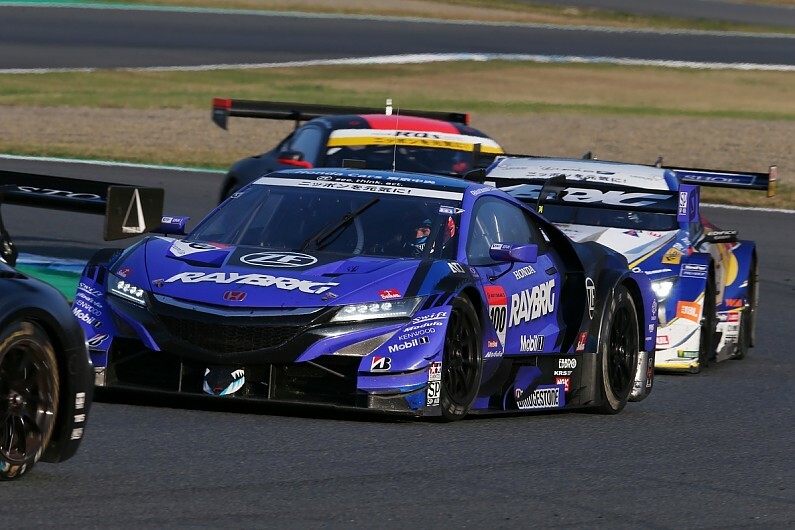 With that result, Button became the first rookie driver to win a title in the premier class of Super GT since Toranosuke Takagi achieved the same feat in 2005, while he and Yamamoto ended Honda’s seven-year title drought. The 38-year-old likened his Super GT success to his 2009 F1 campaign, in which he caused a major upset by winning the championship with Brawn GP. “That was a tough race,” Button said. “They are never easy and that’s what makes it extra-special. “This championship is one of the toughest in the world. That’s coming from someone who has raced in F1 for so many years. “I feel a bit like visitor to this team because these guys have been fighting for so long. “I couldn’t be happier. It’s a long time coming from me. Button had to withstand heavy pressure from Hirakawa in the closing stages of the race while the two battled through GT300 traffic, but he managed to break away from his Lexus rival on the penultimate lap to seal the title. The last dozen laps were a test of what Button had learned in his rookie season, having previously stated that traffic management was his biggest weakness in GT racing. “The stint has probably made me 10 years older with the stress!” Button said. “But Naoki as always did a fantastic first stint. “It took me a little bit longer to get up to speed than the #1 car, so he [Hirakawa] closed the gap quite a bit, and then I had three laps fighting the #38 car [of Hiroaki Ishiura]. Then the #1 car was right behind us. “It’s always tough when you are fighting for a championship, and the car behind seems faster. “If it’s just the two of you, it’s OK, but when you have traffic, it’s very difficult. “I had to really think about where I can put the car to overtake and where I can’t put the car. Button also paid tribute to team-mate Yamamoto, who completed a Super Formula-Super GT title double in Motegi in the same year that his wife gave birth to twins. “This guy Naoki deserves every accolade that he gets because he is unbelievably quick, aggressive,” said Button.